As-built surveys to provide utility companies with an accurate record of the location of services above ground and below surface. Geoterra provides a comprehensive as-built surveying service to operators in the UK’s utility sector. Ensure utilities have been laid to the correct specification. Provide up-to-date, accurate mapping of existing utilities. Reduce risk to workers and public by detecting existing utilities in advance of any below surface works. We have significant experience in providing utility sector companies with as-built drawings of utilities such as telecoms, foul and drainage services, power, water mains and gas. A variety of surveying methods can be used to collect the data depending on the sit specific requirements. 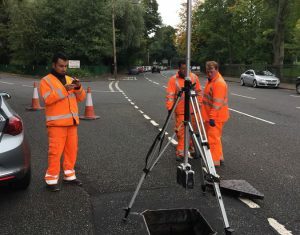 These can range from topographical surveys for above ground features including UAV aerial surveying, mapping and photogrammetry, to ground penetrating radar (GPR), subsurface laser scan surveys, sonar and HD CCTV surveys to locate underground utilities.